Despite the growing list of Latino players refusing to play in the 2011 All-Star game in Arizona if SB 1070 becomes a law and protests by fans, MLB commissioner Bud Selig is keeping mum. 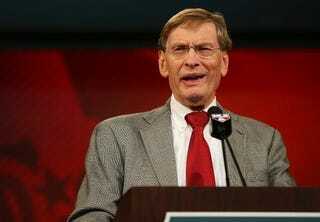 Selig is showing no signs that he will move the game from Arizona, stating, "We'll do things when baseball can influence decisions. … This situation will be solved in the political process at the appropriate time." What? One could deduce that with all of the people lining up to fight against SB 1070, including the federal government, he believes the law will be overturned so that it won't be an issue for the 2011 All-Star game. Hopefully his wait-and-see approach will work with the many Latino players in the MLB.